Method overloading and method overriding are both OOP (object-oriented programming) concepts highly used in variety of Java implementations. We already wrote about the 4 major concepts of OOP in this article. If you are unfamiliar with OOP please check this article first. Method overloading vs. 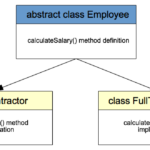 Method overriding is a common Java job interview question. Going to an interview, we can not afford to not know the difference. Method overriding is part of Java inheritance OOP principle. 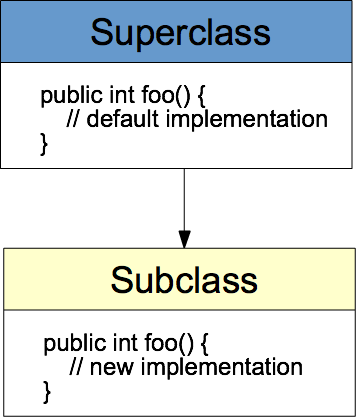 The idea behind method overriding is to change the implementation of given method in a subclass. 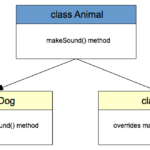 In other words you “override” the implementation of the parent’s class method using the same signature of the method (name, return types, parameters), but implement different functionality inside the overridden method. As you see in the example above, a different method is called based on the parameters we use. This is a nice way to to increase the readability of the program. Java Basics java, java job interview questions, method overloading, method overriding, oop. permalink. 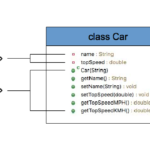 Whenever same method name is exiting multiple times in the same class with different number of parameter or different order of parameters or different types of parameters is known as method overloading. Thanks for sharing the difference. Please correct the definition of Method overloading. we can have diff return type too.